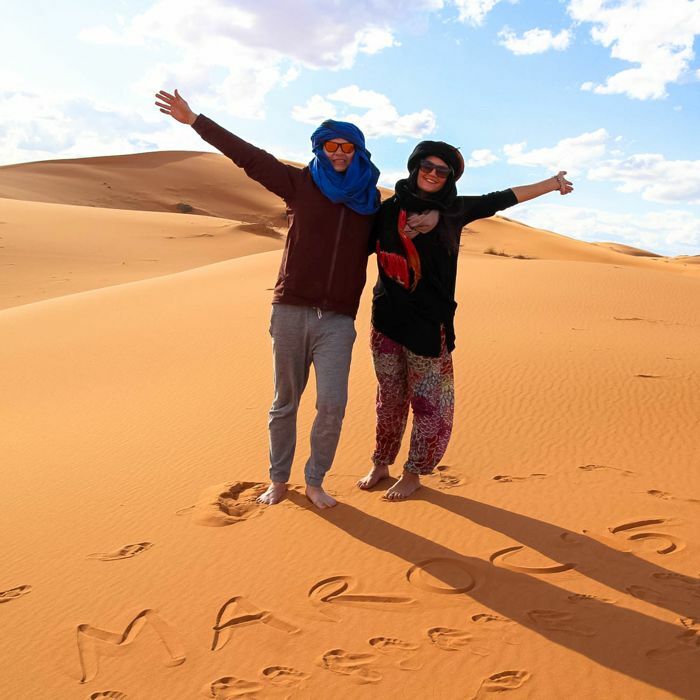 If you ever have the pleasure of going to Morocco, visiting the Sahara Desert is definitely something you’ll want to do. Luckily there are a ton of ways to do that. Most people take a bus tour to the desert and then camel trek into the dunes. Marrakech is probably the easiest place to access the desert from, and almost every tour will pass through there anyway on the way. A good idea is to spend a few days in Marrakech and go from there. Tours range anywhere from three days to ten and can be arranged by your hotel or simply by walking into the medina and inquiring at any shop. Most tours are the same, bring you to the same place and are around the same price. You can’t really go wrong at picking a tour. The bus drive from Marrakech is long, about 9-12 hours depending on where you’re going. There’s two main clusters of sand dunes, Erg Chebbi and Erg Chigaga. Most people go to Erg Chebbi because it’s easier to get to, so it’s a little more touristy but the two are pretty much the same. Sand is sand. The drive through the Atlas mountains is absolutely beautiful and the bus will stop at some cool sites, like Ait Ben Haddou (an ancient fortified city built by the Berber people) and Ouarzazate on the way. As well as some places to eat. It’s a good idea to bring snacks for the bus, reading material and plenty of water as it is quite a long ride. The stops break it up though so it’s not so bad. Once you arrive at the desert, you’ll take camels into the dunes. Make sure everything you bring can fit into a backpack, or the camels won’t be too happy carrying you and your luggage. They’ll have everything you need at the tents, which isn’t much. I would not suggest going to the desert during the months of December through March if you can help it or you’ll be absolutely frozen at night. The temperature drops an alarming amount of degrees and even with four blankets, thick socks (men, women) and a heavy sweatshirt (men, women) I was freezing at the end of March. You can bring a sleeping bag but the tents will have cots and blankets, and if it’s warm enough you can sleep outside under the most incredible blanket of stars you’ve ever seen. Bring comfortable, easy clothes – you won’t be dressing up here and surprise! There’s no showers in the desert. There’s no toilets either, so bring toilet paper. I was told by our guide that you “make like cat” in the sand, so be aware of that before you venture out there. You can also bring a disposable urinal, which makes it super easy and convenient to pee anywhere, even in the tent! Definitely bring your camera, as there are infinite opportunities for amazing photography. A small tripod comes in handy for capturing great pictures of stars. And don’t forget your torch or headlamp with extra batteries. Don’t forget sunscreen for body and face and sunglasses, as you’ll want to protect yourself from the strong Moroccan sun during the day. Gauzy shirts and pants and a wide brimmed hat are also a good idea. Depending on how much walking you’ll be doing, you can wear or bring hiking boots. I found even my sandals to be too much trouble and ran around barefoot most of the time but you could also bring trekking sandals (men, women) or light hiking boots (men, women). Think of how you’d prefer to take a long walk on the beach, it all depends on your comfort level. The sand is clean and soft and warm from the sun and feels great if you like to be barefoot. The tour you’re with will usually provide you with plenty of food and water, but it never hurts to have an extra bottle of water on your person. It might also be a good idea to have some hand sanitizer and antiseptic. Most of all, bring an open mind and an eager spirit and you’ll have one of the most memorable experiences of your life.